Birmingham, We have something HUGE to fulfil your cravings to rave, Amusement 13 group & Gelato are teaming up to bring you a party not to forget. 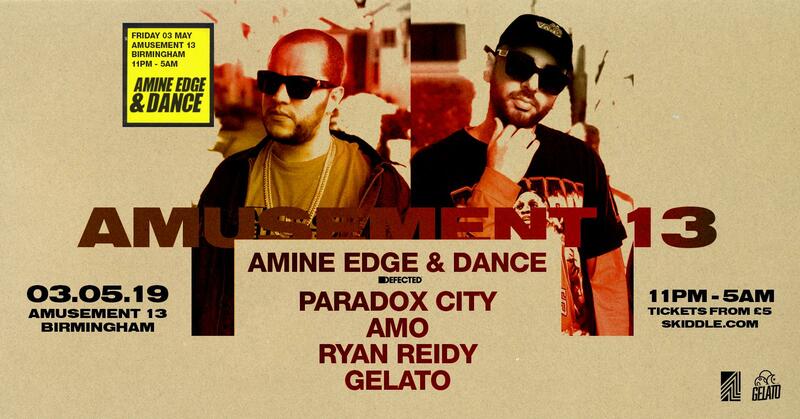 This year Amusement 13 group embarks on a new journey, along with that comes the new ‘House & Techno series’. In which we will bring some of the best and biggest stars of the genre to the second city though out 2019. This week ( 20th of march ) we release the first ever artist to host the main room, Amine Edge & Dance. One of the worlds hottest House DJ duo’s Defected’s very own, Amine Edge & Dance are coming through to blow the roof off this place on 3rd May. Buckle up Brummy ravers, we’re about to take you for a ride. After blazing into the hearts and minds of the international music community with a modernized twist on low-end house and indebted four-to-the-floor, France based producers, Amine Edge & Dance are crash landing into Birmingham during their 2019 UK tour to set fire to the city with their mind-blowing sound. Having climbed the charts, with numerous thumping hits including “Lovelee Dae”, “Halfway Crooks” & “Dancin’”, while releasing on DFTD, CUFF, Abode & more, these boys have been killing the game with their Infectious groove. Dance music heavyweights Paradox City: John Reidy & Jon Brady, have their feet firmly positioned in the House scene. Having taken over the city with their huge event Portal, alongside releasing on VIVA, Electric Party People & FXtion Records, the Birmingham duo have been working hard in the studio with a catalogue of unsigned music that is getting a lot of heads turning. They’ve cemented their status as ones to watch. Amo’s dedication to all things music is unquestionable, with his undying passion for House music, Amo has developed a skill of wizardry behind the decks and a flair for production, firmly placing his name within rave culture forever. Securing performances alongside seminal artists like ANOTR, Pirate Copy, Micheal Bibi and releasing highly acclaimed music featured on both Data Transmission, sub label Shangheid and his newly launched label Fat Worm... Get ready for the only lesson in house culture you’ll need. Ryan has completely shifted the music scene on and off stage, with his staggering work ethic alongside running acclaimed blog, Techno Bible. With the hottest premieres including names such as Dayriuss Syrossian, Sonny Fodera and Mason Maynard, the Birmingham based selecta has broken through the scene, playing the most prolific house events: Afta Dark and Portal. While doing so, Ryan Reidy has left his trademark stamp on everything he touches. Watch this dance preacher at work on the 3rd of May. Hailing from Birmingham, these fresh faced lads have filled the city with colour. With their unchallengeable devotion to the scene, Gelato have taken the word ‘rave’ to a new level. Securing themselves sets alongside legends such as, Michael Bibi, Illyus & Barrientos, DJ Zinc, Reelow, Pax, Del-30, Marco Strous, Kinnerman, George Smeddles and Kettama in just under 6 months. With strong roots in everything underground music they have also secured main stage appearances at major league festivals: A Weird and Wonderful Day Out and MADE. Their style is simple and succinct: it’s all about good vibes and flavours. There will an amazing lighting production on the night and not forgetting the our 'HULK' VOID sound system giving you a musical experience not to forget!